Bundaberg Rum Distillery is the place that blends one of the best rums in the world. It is the most awarded distillery which conducts many guided tours of its grounds. They boast of conducting unique tours that prove to be an unforgettable experience. You can avail The Bundaberg Rum Distillery experience or The Bundaberg Rum Museum Experience. What more, you can blend your own rum at the end of the tour. The guided tours leave you with thorough information about how the rum is processed as well as about the history of the distillery. They also have a gift shop where you can sample two full sized drinks. The staff at the distillery is very knowledgeable and friendly. Visit this place when you are in the neighbourhood to enjoy some fun time. 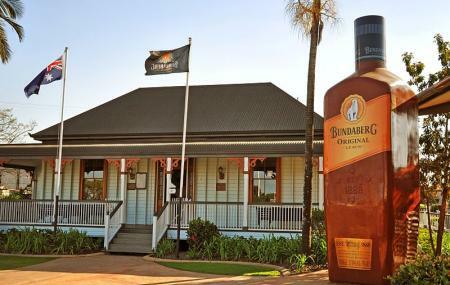 Use Bundaberg trip planner to visit Bundaberg Rum Distillery and many others to your visit. Add comfortable hotels to your plan, choose from the recommended hotels in Bundaberg like Bourbong St Motel, Aaok Riverdale Caravan Park, Oscar Motel and Riviera Motel Bundaberg. Explore the best Bundaberg vacation packages that will take to you important landmarks of the city! For getting in, check out how to reach Bundaberg. Buses 4 and 5 to stop Princess St near Cross St.
Love this? Explore the entire list of places to visit in Bundaberg before you plan your trip. Fancy a good night's sleep after a tiring day? Check out where to stay in Bundaberg and book an accommodation of your choice. The distillery is must see while in Bundaberg. The museum has a great collection of historic implements and stories. We also went on the tour of the factory and it was very interesting. Our guides were knowledge and had a good sense of humour. There is also a tasting including at the end of the tour where you can try some of the premium labels of your choice. Great experience overall. Can not recommend this place high enough , especially in my case with a assitance dog. I would not have been able to do the tour had she not been allowed and in such a challenging environment there was no issue. Special thanks to Nadine for being so great in making the tour with my companion hassle free. Recommend the outside areas for other dogs as well some great photo opportunities and outdoor eating and drinks area means this place is also pet friendly . Nice place and tour! Very friendly and helpful personnel. But unfortunately for me as a collector and Rum lover I missed two important things.... :(. 1: How is molasses produced - nothing on the tour was about sugar canes and the interesting part of how that's done?? 2: Should have been a few minutes set for those of us who would like to ask some questions. The making of our own Rum was on the other hand sometimes I will remember for a long time. Well wort the extra time and money! The shop and tasting was to my liking. Overall it was fun but as mentioned above I will only give three stars for this tour. Tour done mid January 2019. The museum was very interesting, the tour was brilliant. My husband and I had the last tour on a Friday afternoon and we were the only ones. So it was like a private tour. Mack and Crystal (hope I spelt the names right) were showing us around. Their knowledge was amazing. They answered all of our questions. Then we went to the bar for a couple of tasters. Very friendly staff. We enjoyed it very much. Thank you, Mack and Crystal. Great info and layout in the museum. Tour was fantastic, Flora and Craig were a wealth of knowledge and the tasting at the end was so good! Thanks for a terrific morning!